Sausages come in all flavours now, with added tasty ingredients; which makes this filling more interesting than using a bland sausage meat. All plates of food should be colourful, hence the addition of various bright salad veggies to add interest and freshness. Lots of jobs for younger members of the family to assist with as well! Pre-heat your oven to 200 degrees. 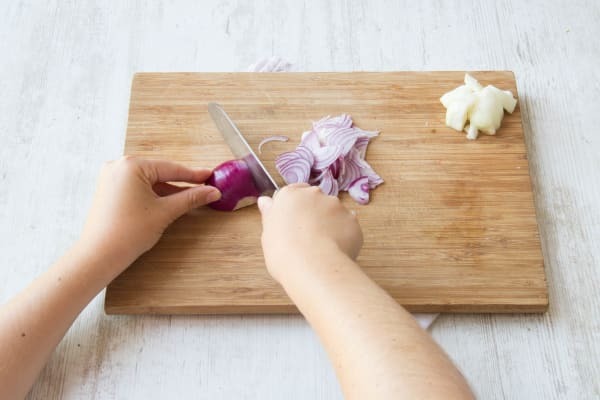 Peel and cut the brown onion in half and chop it into 1cm pieces. Peel your red onion, slice in half through the root and then thinly cut lengthways into half-moon shapes. Tip: Make sure you keep the white and red apart as it’s important that we cook them separately in a bit! Split the sausage lengthways and squeeze the meat into a bowl, discarding the skin. Heat 1 tbsp of oil in a pan and fry the (brown) onion for about 7 mins until lightly browned. LH: Once cooked, add the onion to the sausage meat and stir together. 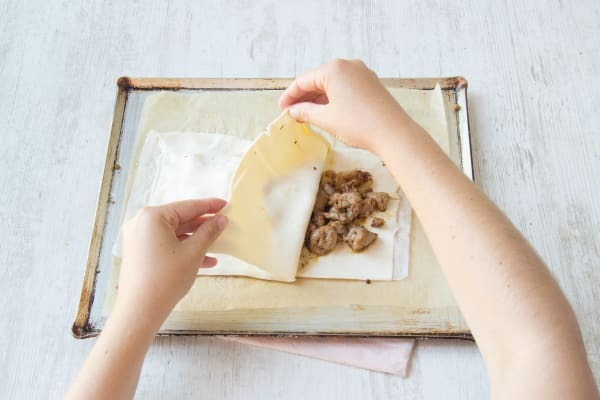 Lay out your sheet of puff pastry on a flat surface and cut into two pieces widthways. One should be slightly bigger than the other. Place the smaller half on a baking sheet and brush the edges of the rectangle with some water. Place the sausage meat along the centre. Place the second pastry sheet over the top. Tip: This piece needs be slightly bigger to fit over the filling. LH: Press the edges together with fingers or a fork to seal the parcel. Tip: If you have any milk, brush a little over the top of the pastry to glaze it, if not don’t worry! Make some small cuts in the top of the pastry to allow the steam to escape and pop your sausage puff into the oven for 20-25 mins. Heat 1 tbsp of oil in the same pan you used in step 3. Add the red onion and the balsamic vinegar. Season with ½ tsp salt and a few good grinds of black pepper. Add 1/2 tbsp of sugar if you have some. Cover and simmer gently for 10-15 mins until softened. 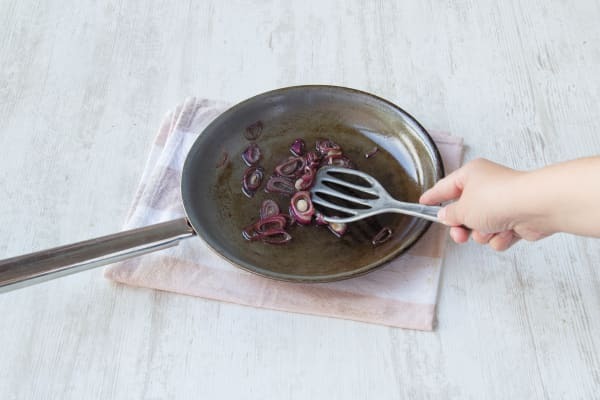 Once cooked, take the pan off the heat and set aside. Cut your cherry tomatoes in half and slice your cucumber widthways. Mix the cherry tomatoes with the cucumber and salad in a bowl. LH: Mix 2 tbsp oil, the white wine vinegar and mustard together in a bowl with a fork. Tip: If you have an old jam jar lying about, you can simply pop the dressing ingredients in there, put the lid on and shake! Drizzle the dressing over the salad. 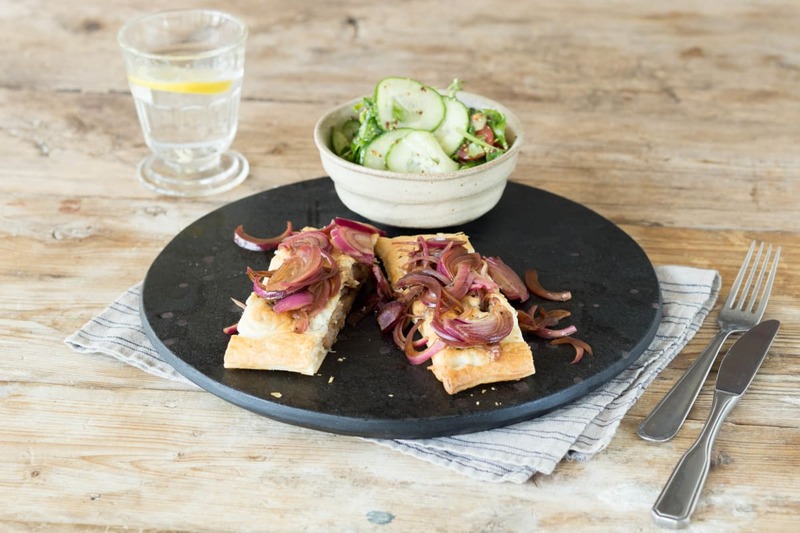 Slice the sausage puff and serve with your red onion marmalade and salad.